Taste test: These are good, tasty, light and crisp kettle-style chips, but they're nothing special, as the name and and description on the bag had us expecting that they would be. 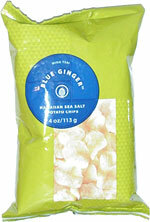 We're not sure what Hawaiian Pink Sea Salt really is supposed to taste like, but the taste isn't a whole lot different from other kettle-style chips that we've tried. Not a bad snack, though. Smell test: Nice aroma, sort of potatoey. Trivia: The bag was very difficult to get open.